Sony confirms 10 "Mastered in 4K" Blu-ray launch titles | What Hi-Fi? Sony has confirmed more details of its Mastered in 4K Blu-ray films, due for release in July alongside the Sony 55in and 65in X900A 4K Ultra HD TVs, plus details on its 4K Media Player and Video Unlimited 4K download service. There will be 10 titles at launch “Mastered in 4K”, with 5 more to follow over the coming months. The 10 are: The Amazing Spiderman, Total Recall (2012), Ghostbusters, Battle: Los Angeles, The Karate Kid (2010), Taxi Driver, Angels & Demons, Glory, The Other Guys, Spider-Man (2002). And here's the list of 4K films shipping on Sony's 4K content delivery system in the US. Now these aren't 4K Blu-rays as such, rather movies that has been filmed in 4K, scanned in 4K and then downscaled to 2K (1080p) to fit on a standard Blu-ray – and designed to look best on a 4K TV. Sony has also now confirmed the imminent launch of its Video Unlimited 4K download service, which will deliver feature films and TV programmes in 4K to rent or buy, with prices starting at $7.99 per film in the US. The discs will work on normal Blu-ray players and standard HD TVs but Sony says the discs are "optimized for 4K Ultra HD TVs" and even suggest – surprise surprise – they will look best on Sony TVs due to the colour balance. Sony showed us the box art for both Total Recall and Ghostbusters. If you own the original Ghostbusters Blu-ray, Sony claims you’ll be able to see a big difference between this new Blu-ray Mastered in 4K release and the original Blu-ray disc as it was only originally scanned in 2K. The 'Mastered in 4K' titles were first revealed at CES 2013 in January. 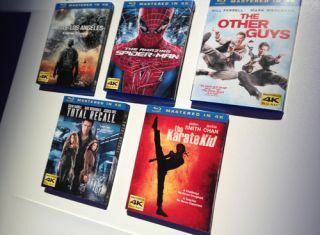 Sony said, "SPHE will begin releasing Blu-rays with the new 'Mastered in 4K' line this year, and anticipate the initial slate to be comprised of more than ten titles. "These titles – including fan favourites such as Moneyball, The Other Guys and The Karate Kid – benefit from an existing 4K master, from which the high quality 1080p picture is derived. "SPHE plans to follow this initial wave with select additional titles throughout the year." Sony has released its 84in 4K Ultra HD TV, the KD-84X9005, and plans to release 55in and 65in 4K Ultra HD TVs in July.